Your teams are already using Workplace by Facebook on a daily basis to collaborate and learn. Do you want to give them easy access to external company content from across your website, blog, and social networks (LinkedIn, Twitter, Facebook…)? Do you want to empower them to become thought leaders, with overviews of their industry market, work ecosystem, and competitors? Do you want to help them become ambassadors across their social networks? Do you want to increase your engagement results? A set of bots that can be configured in the blink of an eye, which feed your Workplace groups with content from blogs, RSS feeds, social networks (LinkedIn, Twitter, Facebook, Youtube, Xing, Vkontakt…) and content curation platforms such as Scoop.it and feedly . Sociabble Curation for Workplace by Facebook installs and configures within minutes. Bots Feed Workplace groups by “posting” content as if it has been shared by a user, including: title, image, summary, link to the content. The administrator can set predefined and exact rules for bots: sources, tags, listening to Twitter hashtags, etc. Admins can also manually filter to select specific content sent by bots. Our Sociabble curation for Workplace by Facebook package, plus employee Advocacy features. Employees can share desired and approved content on their professional social networks with a single click in a moderated and gamified environment. This offer allows you to access Sociabble’s complete employee advocacy and social selling features, from Workplace by Facebook. Rather than connect to Sociabble, users can discover content that is ready to share in their usual workplace groups and become ambassadors from within workplace. 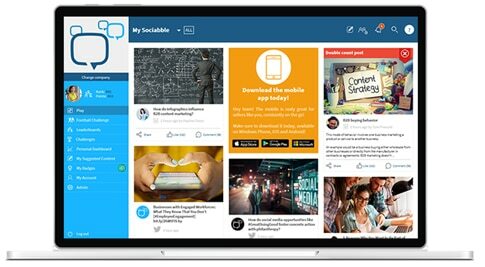 Want To See More about Sociabble for Workplace by Facebook?